Indoor Skydiving Source is proud to present industry growth data from 2015. As you can see from the infogram, this industry is growing like crazy. Over half of the worlds wind tunnels have been constructed in the last 4 years. In 2015 we saw 21 new vertical wind tunnels pop up. While the growth was explosive, we also saw more tunnels close in a year than ever before. 2 tunnels shut their doors in 2015. It is important to note that these two tunnels were propeller below and open flow designs. To our knowledge, no modern recirculating wind tunnel has ever shut its doors. See all the closed locations here. 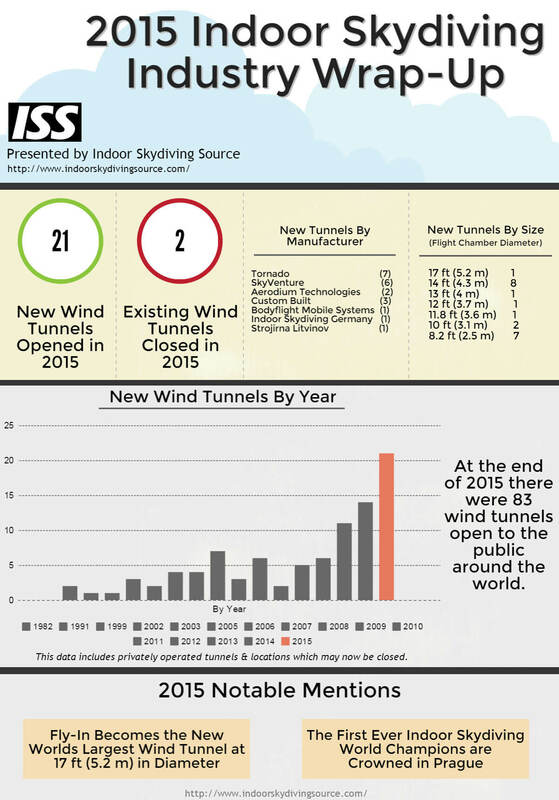 After it was all said and done, the total for the end of 2015 counted 83 publicly accessible wind tunnels world wide. More people than ever before have immediate access to an indoor skydiving facility. 2016 is going to continue the exponential trend we are seeing. From the data we have, we estimate that 2016 will bring double or more the number of wind tunnels that 2015 did. As of writing, there have already been 2 new tunnels opened in Kansas City and San Diego. 33 additional projects are under construction and plan to open in 2016. There are an additional 20 announced tunnels with projected opening dates in 2016. Bodyflight is growing like wild. Competitions are becoming more structured and professionally presented. New disciplines like indoor sky dancing are launching bodyflight into the public eye. Wind tunnels being built in major cities around the world has a huge impact on the public awareness of indoor skydiving. We are excited to watch the future of the sport grow and excited for where the future will lead! - Data for this report was gathered from the ISS location database. - Edited on Feb, 11 2016 -We had incorrectly labeled Bodyflight Stockholm as being contstructed by Bodyflying AG. We removed that attribution and added it to Custom Built. - Edited on Feb, 12 2016 - We had incorrectly included Aerodium Buenos Aires as having closed in 2015. This was actually a mobile wind tunnel that had moved on. The count for closed tunnels in 2015 was reduced from 3 to 2 in the graphic and text. I would like to know the cost to invest in a wind tunnel and what the cost / time would be per the consumer.